Michael D. Staskin was born September 8th, 1948 in San Antonio, Texas to Sidney and Celia Staskin. Michael and his two sisters grew up on Air Force bases throughout the world. One of his favorite places that he lived was Morocco where he learned how to speak French and explored the dessert with the other "air force brats". Sidney and Red (Celia) planted roots in Colorado. Michael finished his last year of school at Thornton High School in 1966. He was accepted to the University of Colorado, where he became a forever Buffs fan. In 1969, Michael applied and was accepted to the Denver Police Academy. This momentous event would forever shape his life. Michael graduated in 1970, he began his illustrious police career as a patrol officer at District 3. Michael spent a majority of his career as a Burglary Detective at District 4. While on the force he received numerous awards and accommodations. His Detective work was legendary. He earned respect from his peers and commanding officers. The friendships that he made on the DPD were those of a brotherhood. Michael explained that the bonds you form with the men and women in blue lasts a lifetime. Michael was a very proud father to Shannon Kelley (Byerly) and Allison Ann (Pope). He was a wonderful father who was always a role model to the girls. He told them to be sure to leave this world a little better than you found it. He also reminded Shannon and Alli to find one thing to smile about each day stating that if you could do that then it had been a good day. He shared so many of these lessons with his girls. His close relationships and abundance of love for his daughters was clear to everyone that knew him. Michael retired from the Denver Police in 2004. His love for travel and zest for life landed him in Thailand where he lived until 2007. 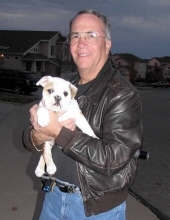 He moved back to Highlands Ranch Colorado to be close to his daughters and his grandchildren. He is survived by Jacob (14), Andrew (14), Ava (11), Lydia (10) and Stella (3). Pa Pa Mike as his grandkids called him, was amazing. He would have inside jokes with each of them and gave them a $1 bill each time that he saw them. He enjoyed spending time with them and would always be found smiling and laughing with them. They recently enjoyed a family trip to Italy to celebrate Pa Pa Mike's 70th birthday. The memories that were made on that trip will forever be in all of their hearts. Michael enjoyed working security jobs throughout his retirement. Most recently, he found his calling by working at the Civil Service Department as a Background investigator for new police and fire hires. He explained how much this position meant to him and to have the interaction between hopeful police officers and firefighters. He thoroughly enjoyed being part of the process and was filled with pride when an applicant was hired. Friendships- these relationships filled Michael's life. His sense of humor was contagious. You could find him most days at a retiree breakfast or lunch. He had so many friends that it is impossible to write about each one. Everyone can attest to his loyalty and willingness to be there for others. His life was full with love and laughter from all of these special people. The friendships were not just with humans, he loved his English Bull Dogs, Winnie (deceased) and Lady Di. You could find him relaxing with them on his chair or walking them in the neighborhood. Michael had several health scares (those that knew him, who could forget the brown recluse spider bite), however; he lived an action filled life without any difficult health limitations. Recently, he had a procedure to remove kidney stones. The procedure had gone well and his daughters were fortunate to spend one on one time with him while he felt very well. Unfortunately, a couple of days later Michael passed of unknown and unforeseen causes at his home on January 29th, 2019. The world lost a hero and heaven gained an angel. His daughters are moving forward as they know he expects them to but with a heaviness in their hearts and much sadness. He was loved by everyone who were fortunate to have known him. To send flowers or a remembrance gift to the family of Michael D. Staskin, please visit our Tribute Store. "Email Address" would like to share the life celebration of Michael D. Staskin. Click on the "link" to go to share a favorite memory or leave a condolence message for the family.